Most people don’t realize that not all ground coffee is created equal. The size and shape of your coffee particles greatly affects extraction and therefore the taste of your coffee. We talked about extraction in a previous post, but to remind you, extraction occurs when coffee particles dissolve into water. The water “extracts” coffee sediment and flavor from the particles, giving coffee it’s color and taste. Grind size can range any where from very fine, soft coffee particles, to larger, rougher particles. Think sugar sand vs. sea salt. With smaller grind sizes, there is more surface area for the water to come into contact with. This means the coffee will extract (or dissolve into the water) faster and easier – which isn’t necessarily a good thing. If coffee is ground too fine for your brewing method, it can “over-extract.” In other words, the water will break down the coffee so much that acids will be released and your cup will taste bitter. If your particles are too large, the water won’t be able to extract enough coffee and you’ll end up with a weak, or “under-extracted” brew. 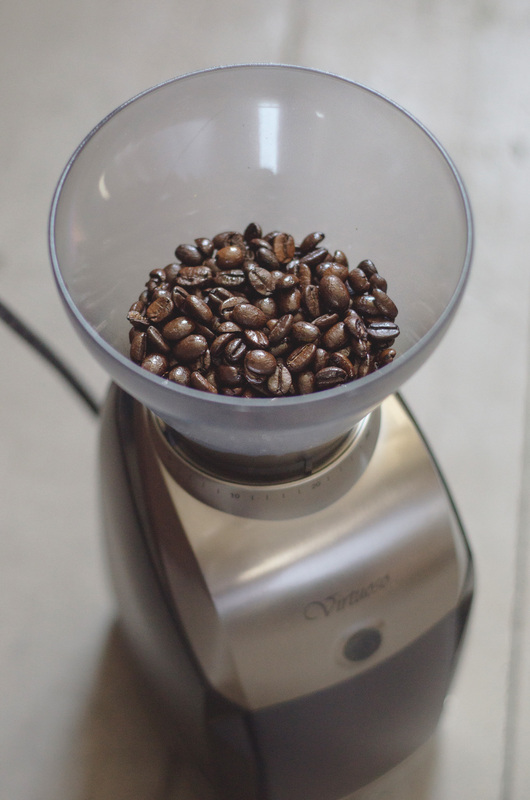 Grind size is all about finding the sweet spot for your coffee and brewing method. Check back tomorrow for more grinder talk! Have questions about coffee or brewing? Shoot an email to social@lacolombe.net. When using a French press, you will want the particles in your ground coffee to be larger, more like sea salt. When you grind it too finely, it over-extracts the coffee and releases acids, making it more bitter. The kind of grinder you use makes a difference too. If you are using a blade-type grinder, you will get a mixture of larger pieces and even some dust. The longer you grind trying to make the larger pieces smaller, the more dust you will get and this will over-extract as well. Another consequence of grinding too long is heating the grounds, which is also less than ideal. It’s better to use a burr mill since they produce a very consistent grind with less concern about heating of the grounds. For the Keurig, since the water passes through the grounds quickly, you will want the grind size to be smaller. I’m not 100% sure about the percolator, but since the coffee is in contact with the water longer like a French press, I believe you will want a larger grind size. Lastly, the water you use will make a difference as well. If you live in a place where the water is chlorinated (smells a pool and tastes bad), you will want to use filtered or spring water. If your refrigerator has a water dispenser with a carbon filter, this will improve the water dramatically. from $50 or $60 for a manual grinder or cheap electric unit to hundreds for a more professional unit – and how quickly you use the coffee, you may want to simply order the coffee pre-ground. I know this is less ideal than grinding it just before use, but getting the grind right without spending a lot of money may be the best compromise in your case.